"These images are not intended to be exact representations of school lunches, but instead, are meant to portray different types of foods found in cafeterias around the world. To create this series, we evaluated government standards for school lunch programs, regional cuisine and food culture, and photos that real students had taken of their meals and shared online." In school cafeterias in Italy, children enjoy local fish on a bed of arugula, caprese salad, red grapes and fresh bread. In Korea, lunch includes fish soup, tofu, steamed rice and bell peppers. 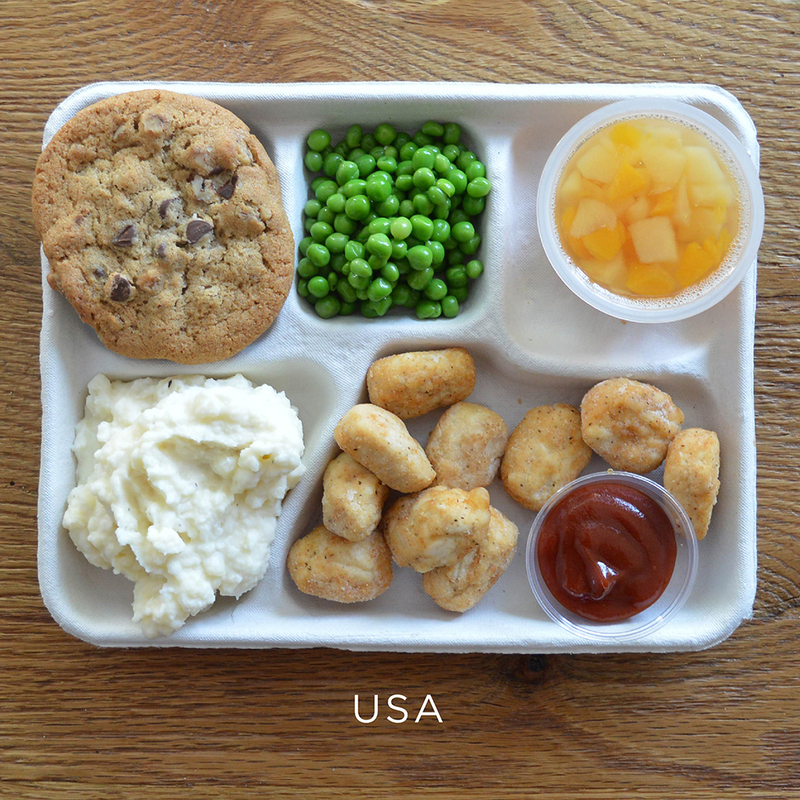 In the US, though, school cafeterias are serving up frozen chicken nuggets, processed fruit preserved in syrup and cookies. Those are some of the findings illustrated in a recent photo series compiled by SweetGreen, an East Coast salad restaurant chain. According to the company, whose SweetGreens in School program teaches students about nutrition, fitness and sustainable eating habits, 32 million schoolchildren nationwide eat school cafeteria lunch every day and take in more than half their calories at school. That makes the differences in school lunch around the world even more noteworthy. With childhood obesity rates on the rise and recent science establishing a strong link between nutrition and cognitive function, lunchrooms have become the next front in the fight for healthier eating even as loopholes in school lunch regulations still define things like French fries and pizza as vegetables. With those loopholes in mind, here’s a look at what’s on school menus elsewhere.